Are cloth nappies as bad for the environment as disposable nappies? Our thanks to Fiona Ward of Darlings Downunder, for her time and expertise in compiling this comprehensive post. Water usage is a real issue for us in Australia, and it’s right that we should be concerned about how much water we use and do what we can to reduce our consumption. So, is the amount of water needed to wash cloth nappies a valid argument against their use? Is it true that the amount of water used to wash cloth nappies for a child has as great an environmental impact as disposable nappies? I could get facetious here and ask, if washing reusable items is so bad for the environment, why aren’t we using plastic cutlery and plates at every meal, wearing single use clothing so we don’t need to use a washing machine, and wearing disposable nappies ourselves so we don’t have to flush the toilet? We don’t often consider that large amounts of water (and other resources) are used in the production of disposable nappies. In fact, the same amount of water is used in the production of disposable nappies as in the production and home washing of cotton reusable nappies. 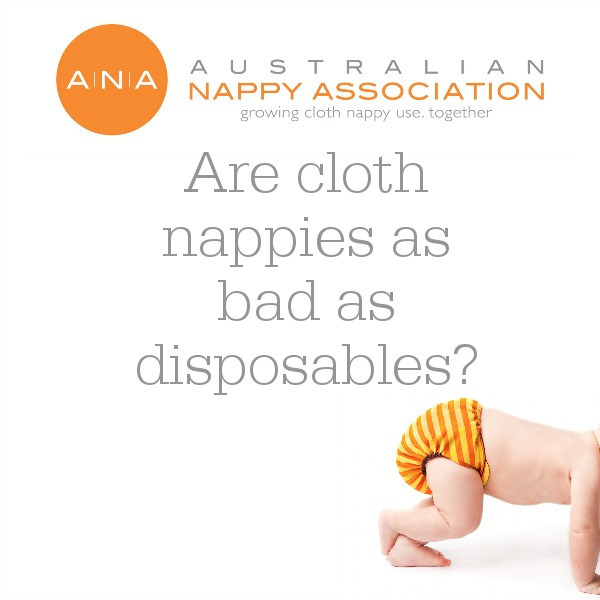 This is according to the Life Cycle Assessment carried out in 2009 by the University of Queensland that compared reusable and disposable nappies in Australia. The argument that disposable nappies are made in China or elsewhere where they don’t have our water shortage issues is also incorrect (not to mention ethically obnoxious). Last time I checked we were all living on one planet and it’s the only one we’ve got. Check the packaging in the supermarket – many brands of disposable nappies are made right here in Australia using Australian water and Australian resources. But even if more water was used in washing cloth nappies than in manufacturing disposables, cloth still gives you more control over your environmental impact. By choosing to use cloth, you will save money. According to CHOICE Magazine, a typical baby goes through about 6,000 disposable nappies with the total cost (of just the nappies, excluding wipes & other accessories) varying between about $1,800 and $3,000+ each child. You can cloth nappy several children for significantly less than that! Take that money you save and use it to install a water tank, a grey water system, solar hot water, or something else that will offset the resources you are using when you use cloth. You could make your cloth use carbon neutral! Cloth gives you so many more options when it comes to reducing your environmental impact. The money it saves can also let you do something BIG that will help reduce your family’s environmental impact well into the future. The University of Queensland study looked at four environmental indicators: water resource depletion, non-renewable energy depletion, solid waste and land use for resource production. It considered the ‘life cycle’ impact: from the growing of cotton (for the cloth nappies) and timber (for the wood pulp used in disposables), the manufacture of the nappies and transportation, through to use (including water & energy used in washing cloth nappies) and disposal. Not only was it found that the water usage between cotton nappies and disposable nappies was comparable, they also found that disposables used more energy and more land resources in their production and that disposables generate 20 times more solid waste. Kimberly-Clark Australia (manufacturer of Huggies) supplied most of the data regarding disposable nappies. Different average number of nappy changes a day were used to reflect the fact that many people change disposables less frequently than cloth: The study considered low to high impact figures depending on the number of nappy changes. The low impact figure for disposables was 4 changes a day (compared to 5 for cloth) and for high impact – like at the newborn stage – 7 changes a day (cloth was 9). As far as water & energy used in washing cloth nappies, the study included the difference in the total energy used in home washed nappies if you use hot water compared to cold, and a top loader compared to a front loader, and also examined the difference between home washing and using a nappy service. 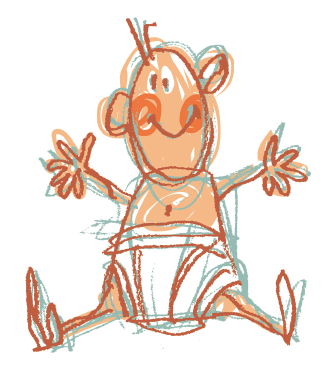 The study considered nappies made of cotton fabric only. Hemp and bamboo fabrics are generally considered more environmentally friendly crops to grow (using less water, pesticides and land space). The researchers included covers (of the plastic pants variety) in their energy/water/waste figures for cloth nappies. The costs for the cloth nappies included energy & fuel transportation costs assuming the cotton would be grown in Australia, transported to Asia for processing and milling into fabric, and shipped back to Australia. Disposable nappies are composed of 40% cellulose (wood pulp), with Australian pine forest plantations the source. Pulp production is responsible for 75% of the non-renewable energy required over the life-cycle of disposable nappies, even though 46% of energy used in pulping is renewable. Home-washed reusable nappies were found to use less non-renewable and total energy over the life cycle than any other nappy system, regardless of the number of nappies used, the mass of nappies, or the type of washing machine. Reusable nappies washed in a top-loading washing machine were found to use more water than disposable nappies or reusable nappies washed in a more efficient front-loading machine. Water resource depletion associated with the softwood production for disposable nappies was higher than for the cotton growing stage of home-washed nappies. This is despite the fact that forestry is typically much less water intensive (on a per-area basis) than cotton growing – indicating that it was the much larger mass of raw material required for the production of disposable nappies over the 2.5 year lifecycle that was the driver for this result. The study looked at the nappy use for a single child. 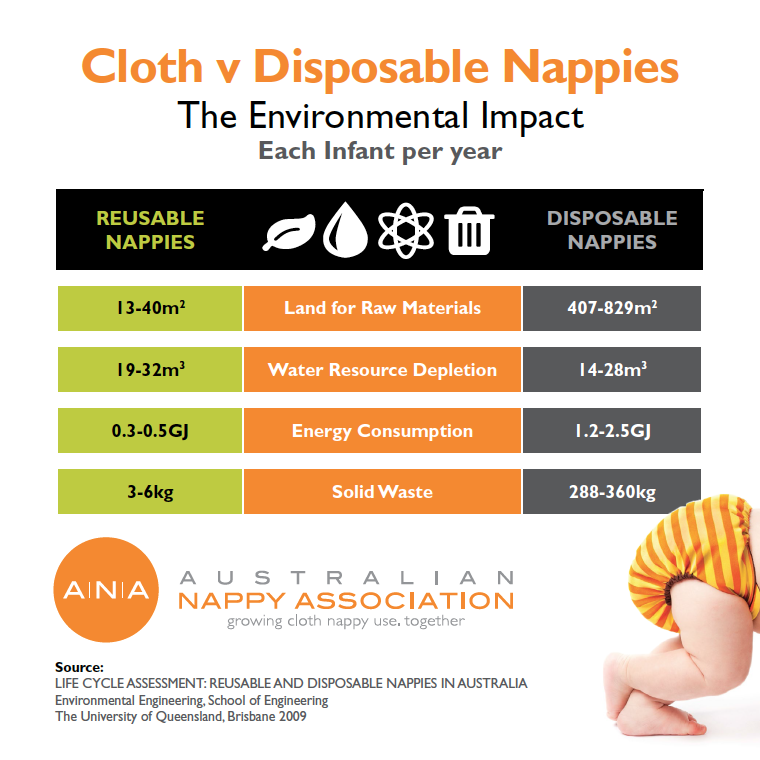 Obviously, if the same cloth nappies were able to be used on more than one child, the environmental impact of those nappies decreases further. If you’d like to read the University of Queensland’s Life Cycle Assessment, you can download it from our Resources We Love page. 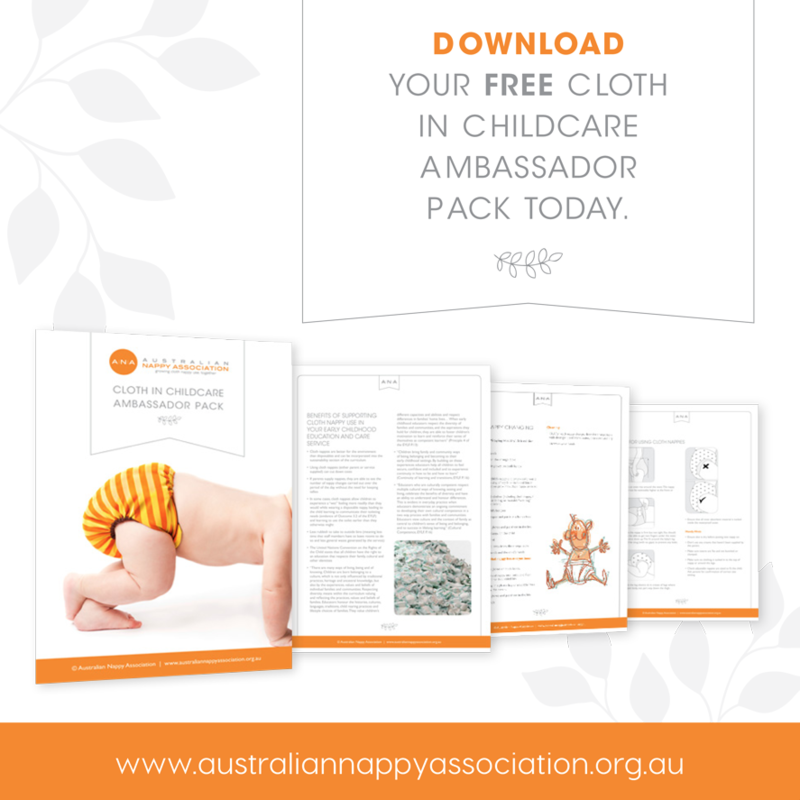 Fiona Ward is a founding member of the Australian Nappy Association and together with her sister, owns one of Australia’s longest-standing cloth nappy retail superstores, Darlings Downunder. The Darlings Downunder blog is a veritable treasure trove of cloth nappy goodness.